This week sees the release of another Motor Stories eBook built from our collection with the help of Distributed Proofreaders. 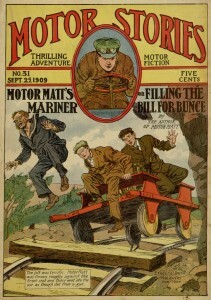 In Motor Matt’s Mariner; or, Filling the Bill for Bunce, complications arise in the stolen ruby case introduced in the previous adventure, putting Matt and McGlory in new danger. Along the way, they encounter a bizarre surprise in a movie theater and have a dangerous outing on a motor-powered hand car. The main story is followed up with a couple of short filler pieces: “Jerry Stebbins’ Hoss Trade,” a tale (written in dialect) of a Bucks County native being scammed in Philadelphia, and “The Phantom Engineer,” a brief ghost story set on the rails. As always, the complete text of the issue can be read online or downloaded through Project Gutenberg.